The post-Roman kingdoms of southern Britain around AD 500. Kingdoms shown in capitals: Anglo-Saxon in italics, Britons in regular case. 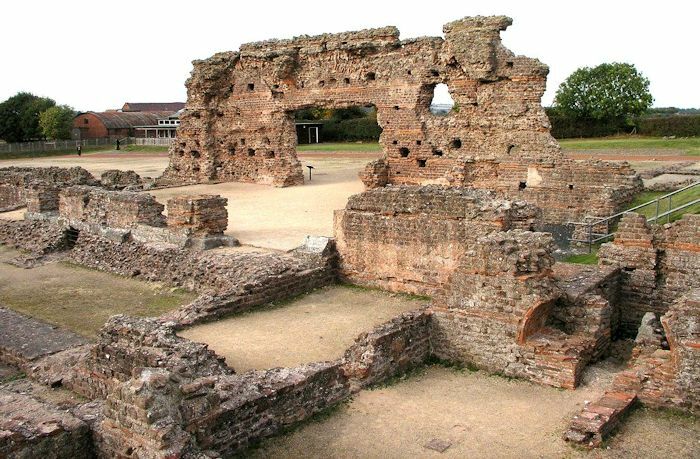 The capital of early Dark Age Powys had been an old Roman city called Viroconium, around five miles east of modern Shrewsbury in the English country of Shropshire. 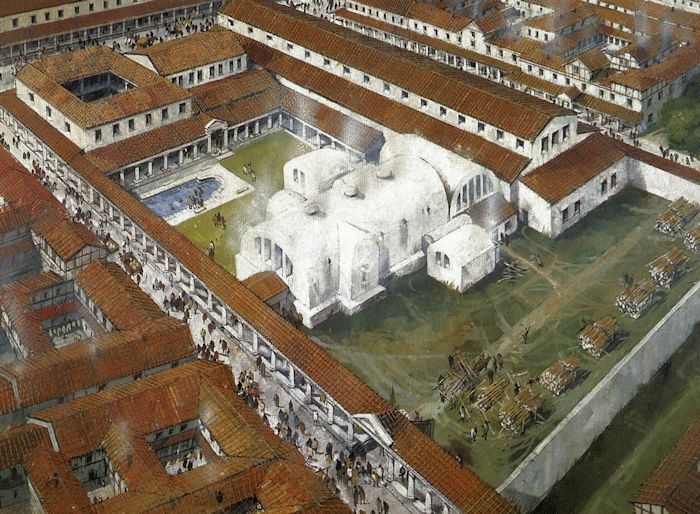 When the Romans left Britain in AD 410, most Roman towns were abandoned but Viroconium continued to be occupied. It had been the fourth largest town in late Roman Britain, but the three others, London, Lincoln and York in the east of the country, were quickly overrun by the invading Anglo-Saxons. Viroconium, however, being in the centre of the country, remained free and effectively became the most important city in early Dark Age Britain. Remarkably, the ruins of Viroconium – some of its walls and foundation stones - still survive in open countryside just outside the modern village of Wroxeter. Over the last 35 years many archaeological excavations have taken place at Viroconium to reveal that, unlike most other Roman towns which had been abandoned for more easily defended hilltop fortifications, the city was still a thriving, walled town for well over a century after the Romans left. Graham began his search for the historical Arthur by asking a simple question. From where did he rule? In the medieval tales Arthur is said to have ruled form a magnificent city called Camelot. Unfortunately, the authors disagree on its location, and where it was originally thought to have been has long remained a mystery. However, if it existed, wherever it was, the city would not have been called Camelot during a historical Arthur’s time: the name “Camelot” was an invention of the twelfth-century French poet Chrétien de Troyes. As the name of Arthur’s fabled city had been forgotten by the period Chrétien was writing, the word “Camelot” was adopted by subsequent authors. During the early Dark Ages, Britain was divided into separate kingdoms, and Nennius says that Arthur was the leader of an alliance of these kingdoms. So, to locate Arthur’s capital, Graham needed to determine from which of these kingdoms the renowned king originated. In the Bodleian Library at Oxford University there survives a seventh-century work called the Song of Llywarch the Old (in a manuscript catalogued as Jesus College MS. 111) that contains one of the oldest surviving references to King Arthur. A series of war-poems attributed to a court poet named Llywarch, the work praises the exploits of a chieftain called Cynddylan (pronounced “Qune-thill-an”) who died fighting the Anglo-Saxons in 658. In the work, the author makes reference to Cynddylan being a direct descendant of Arthur, implying that Arthur had once ruled the kingdom that Cynddylan ruled. This, Llywarch tells us, was the kingdom of Powys which covered what is now west-central England and east-central Wales. When Cynddylan was defeated, the Anglo-Saxons occupied eastern Powys, forcing the Britons to abandon their capital and retreat into the Welsh Mountains where a modern county still bears the old kingdom’s name. If Arthur had been Cynddylan’s ancestor, then this same capital may once have been his capital. The latest archaeological excavations at Viroconium have revealed that there was a major rebuilding of the city around AD 500. The nerve centre of this new Viroconium was a massive winged building that appears to have been the palace of an extremely important warlord. As this building work seems to have been taking place at the end of the fifth and beginning of the sixth centuries, it may well have been the seat of power for the chieftain who led the Britons at the time Arthur is said to have lived. The stories of King Arthur say that he had been the most powerful British leader and ruled from the most important British city around the year 500. Historically, Viroconium had been the most important British city at that time. In other words, from the archaeological perspective, Viroconium was the most likely capital of a historical King Arthur. Over 1500 years old, the ruins of Viroconium near the town of Shrewsbury in central England may be the remains of the historical King Arthur’s capital – the real Camelot.